Candidates can download all the CGPSC Assistant Professor Previous Papers for each subject which is in need to attempt the Assistant Professor Written Examination. Through this process, the officials of the Chhattisgarh Public Service Commission (CGPSC) are ready to select the eligible candidates. Furthermore, the test may be conducted in the month of April 2019. So, all the candidates need to start preparation with the help of the given solved papers, Chhattisgarh PSC Selection Process 2019, the psc.cg.gov.in Exam Pattern. To the bottom, we have given direct links to download the CGPSC Assistant Professor Sample Papers. The officials of the Chhattisgarh Public Service Commission (CGPSC) had declared to hire suitable candidates through the two rounds as given below. Check the CGPSC Exam Pattern 2019 which is mandatory before attempting the test. Moreover, you cannot gain more marks in the examination without notifying the Syllabus, CGPSC Assistant Professor Model Papers. So, all the applied candidates need to look at the below table to know the test pattern. Within that, you can identify the structure of the question paper together with the number of questions, the number of marks and also the time duration. And the Written Test is of Objective type. We heard that many of the candidates are eagerly searching for the CGPSC Assistant Professor Sample Papers over the internet. So, to help all such candidates we came up with the latest information through this article. And you can easily start preparing for the test by following the given stuff. 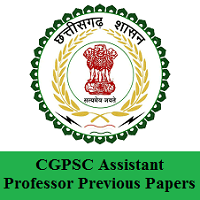 Furthermore, we had attached the direct links for the CGPSC Assistant Professor Model Papers PDF Download for free of cost according to subject wise. not only the pdf’s we have alos given those papers with suitable answers and solutions. We hope that candidates have notified all the suitable CGPSC Assistant Professor Previous Papers. So, to get all such updated information you must stick on to our web portal @ FreshersNow.Com. Furthermore, you can leave a comment in the below section of this article for any other queries.